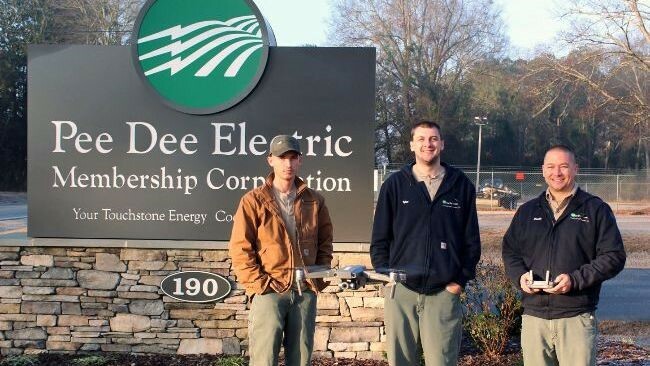 Since drones are operated in national airspace, three Pee Dee Electric employees recently became licensed Commercial UAS Pilots through the Federal Aviation Administration. After several training sessions, including a TEMA-led drone session at their Wadesboro office, Adam Sweatt, Tyler Gainey and Dustin Marsh are now able to operate drones. The use of a drone will also eliminate the need to place an employee in a dangerous situation. If an area is flooded or hard to access, for example, the drones will be able to scope out what may be ahead and what materials will be needed. Roughly one-third of all NC electric co-ops are currently utilizing drones for system inspections.